The horrific mass murder of nine people at a historic black church in Charleston, South Carolina was an act of racist terrorism. The attack evokes the painful memory of the KKK bombing of the 16th Street Baptist Church in Birmingham, Alabama in 1963 that killed four black girls, along with a long history of brutal attacks on black lives in the US. Some, including President Obama, have focused on the widespread availability of weapons in their response to this atrocity. We agree that this is an important issue but it is not the key issue here. Nor is this the product of mental illness. While Dylann Roof appears to have acted alone, he was inspired by a white supremacist ideology with deep roots in American society in general and the South in particular. It’s no surprise that he proudly posted pictures of himself displaying the same Confederate flag that officially flies on government buildings in South Carolina. This flag has no business flying on government buildings. Make no mistake, it is a symbol of slavery, racism and the brutal horrors of centuries of oppression against black people. It is true that large numbers of working class whites in the South who identify with the Confederate flag do not consider themselves racists and see the flag as representing Southern pride and heritage. Nevertheless, the whole history of this flag shows how it has been used again and again as a symbol to rally reactionary forces against struggles for black freedom, first as the battle flag of a slave-owner’s rebellion in the Civil War, and then by the KKK and against the Civil Rights movement. 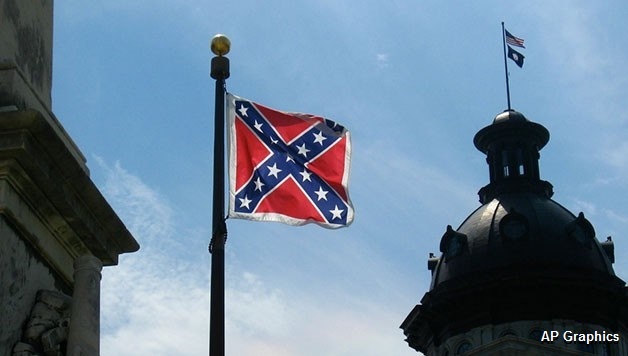 For decades after the Civil War the Confederate flag did not fly on government buildings in South Carolina. It was only in 1962, in the context of a massive movement against racist segregation laws that the pro-Jim Crow establishment introduced the flag again. It’s very significant that a whole number of leading establishment figures in the South including the Governor of South Carolina have now come out in favor of taking the flag down. This shows the effect these events, on top of the Black Lives Matter protests, are having. Already, Alabama state leaders have quietly begun to remove the flag from state buildings. The establishment fears a deeper upheaval. They are very aware of the potential for the flag to become a focus of powerful struggle. 50,000 marched against the confederate flag in South Carolina in 2000. Furthermore. the huge outpouring of multiracial solidarity in Charleston with more than 25,000 marching in solidarity with the victims on June 21 shows the complete rejection of violent white supremacy by the vast majority. Throughout history it’s been mass movements that have challenged the deep-rooted structural racism of the U.S. and moved society forward. It’s been black workers who have been at the forefront of the fight for a $15/hour minimum wage, a demand that resonates with millions of people from all racial and cultural backgrounds. While many figures in the establishment are undoubtedly hoping that rapidly removing the flag from public buildings will cut across a wider movement, what is precisely needed is to link a united mass struggle to demand this flag be removed with a bigger fight against all forms of systemic racism. 150 years after the defeat of the Confederacy, it’s clear U.S. society has failed to overcome the racist legacy of slavery. By fighting all forms of racism tooth and nail and linking this to a bigger struggle by the powerful multiracial working class in this country for a new egalitarian, socialist society, we can bury the racist legacy of slavery once and for all. Black Lives Matter! Remove the Confederate Flags and all symbols of the Confederacy from government buildings! Stop the suppression of voter rights for African Americans. For full democratic and civil rights for all! End mass incarceration and the school to prison pipeline! Redirect millions from prisons to job programs. End the racist war on drugs. Build a mass black working class freedom movement as part of rebuilding a fighting labor movement. For a $15/hour minimum wage and union rights for all workers.